It had been rumored to be taking shape for more than 24 hours, and finally on Friday night came the official announcement: Mali’s ruling CNRDRE junta has signed an agreement with the Economic Community of West African States (ECOWAS) to transfer power to a constitutionally legitimate leader, in exchange for an amnesty for the CNRDRE’s members and the lifting of economic sanctions against Mali. You can watch the video of the junta’s announcement here. It appears that the new head of state will be Dioncounda Traoré, speaker of Mali’s National Assembly as well as the presidential candidate of the powerful Alliance pour la Démocratie au Mali (ADEMA) , which dominated multiparty politics here from 1992 until 2002. Dioncounda — Malians generally refer to him by his first name, since his last is so common here — has been talked about ever since the coup, because as head of the National Assembly he would be the designated successor to the president if ever the latter could not fulfill his duties. 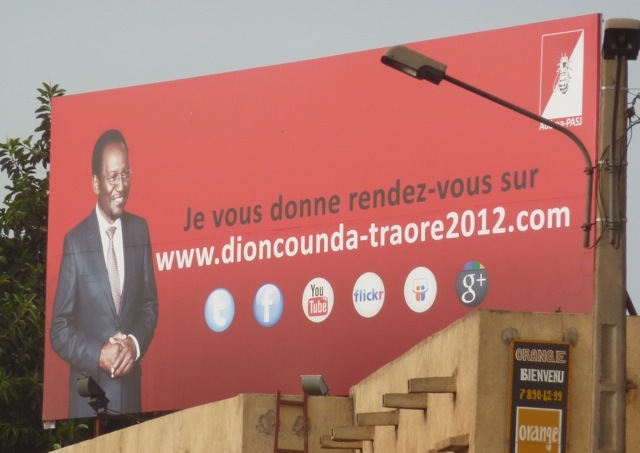 When the coup happened on March 21, Dioncounda was out of the country, in Burkina Faso to be exact, and arrived back in Bamako late on April 7. He then appeared on the 8:00 p.m. ORTM news to discuss his new role. Key to this transition will be naming a new prime minister, who will actually oversee the composition of a new government and try to organize national elections (constitutionally mandated within 40 days). Dioncounda’s actual role in this process, as reported by RFI, may be rather minor. How will Malians respond? Early reactions I’ve heard and read online have expressed relief that perhaps Mali’s political nightmare may finally be ending. But nobody is celebrating — not even, I suspect, Dioncounda Traoré, who from the beginning had been rumored to be reluctant to take the job of interim president. It’s unclear how elections can be organized in such a short period when the northern half of Mali’s territory is now occupied by rebel groups and the Malian army is in complete disarray. Dioncounda also carries significant political baggage with him. He is a savvy insider, and as speaker of the National Assembly since 2007, he let the country’s sole legislative body become a rubber stamp for decisions made by President Amadou Toumani Touré. He is therefore associated with the same corruption, nepotism and abuse that made Touré so unpopular during his second term (2007-2012). Moreover, even if Mali’s classe politique manages to sort out a smooth return to constitutional rule, the country’s greatest challenge remains before it: fighting the rebellion and reunifying the country. Now all eyes turn to the nomination of the new prime minister, which must be someone around whom Malians of various ideologies and affiliations can unite. My prediction, given Mali’s current political climate and frustration with its politicians, is that whomever Dioncounda names will be either an outsider or Ibrahim Boubacar Keita, a former prime minister and opposition party leader. Keita (or “IBK” as he’s known here) is one of the few major figures on Mali’s political scene today who was not co-opted by President Touré and his “consensus” approach. But IBK is also a presidential candidate (he was widely believed to have been cheated out of a spot in the second round of presidential elections in 2002), which may work against him. A really interesting choice for P.M. would be Ahmed Mohamed ag Hamani, who served in this role from 2002 to 2004. He was President Touré’s first prime minister, which would also be a strike against him in the eyes of many, but he is also a Tuareg (well, technically un targui, which is the singular form). Appointing him to run Mali’s transition during this critical phase would send an important message to Tuareg everywhere, not to mention to non-Tuareg Malians, that the Malian state is truly committed to serving people of all ethnic groups and regions. This entry was posted in Uncategorized and tagged coup, politics. Bookmark the permalink. 3 Responses to Light at the end of the tunnel? Good news! I was fortunate to work closely with IBK and a delegation from Mali when they attended Meetings in Houston in 1999. I realize it was a long time ago and that I never had an in depth conversation with him about politics, but I have great feelings about him none the less. He is extremely bright, levelheaded, savvy and down to earth in social situations. In talking about his country, he came across as a realist, a pragmatist and a patriot. Fingers crossed my instincts were/still are right on and he is appointed PM again. I would have faith with him at the helm of this situation. So glad to hear things are looking up. Thank you Bruce for another great text about developments in Bamako. The agreement leaves many things open and we will have to wait and see what will happen next in Bamako. Are Dioncounda and IBK really willing to forfeit their chances to the presidency aftre the elections by taking up very difficult roles in the interim period? In the meantime, what is happening in the north of Mali is tragic and worrying. With so many armed groups already intervening and perhaps the Ecowas armed forces to come, the creation of still another politico-military movement is announced. (http://www.bamanet.net/index.php/actualite/autres-presses/17577-nord-mali-les-arabes-annoncent-la-creation-dun-mouvement-politico-militaire.html).